Minnesota has a reputation as a great place to call home. In national rankings of quality of life, job quality, child wellbeing, and cost of living we look pretty attractive. Among the competitive advantages of Minnesota is that historically we have been an affordable place to find a home. However, across the state communities that have long had pent up demand for housing are continuing to feel the squeeze, while areas that just a few years ago were staying ahead of the need are beginning to fall behind. Advocates, businesses, and policy makers all know that our communities need people who need affordable housing – childcare workers, people to work in our factories and food processing facilities, construction workers, and home health care aides – but the idea of meeting this need can start to feel abstract and insurmountable. So, what do we mean when we say that we need more affordable homes in Minnesota? Where do we even begin? According to the newly released report from the Governor’s Task Force on Housing, Minnesota needs to produce about 300,000 new homes by 2030 to meet both pent up demand and projected future growth. 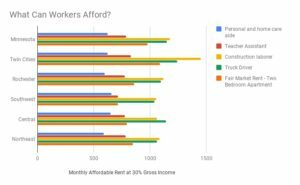 While this need exists across all geographies, incomes, and types of housing, the gaps are most pressing for the lowest wage workers, seniors on fixed incomes, and other low wealth families. If population growth continues at the forcast rate, there will be an additional 168,209 people living in Minnesota in five years and by 2026 we will see population gains of 256,250.6 This is good news for the economy since we need more people coming to Minnesota to live and work for our communities to thrive and our businesses to grow. If more jobs in Minnesota are family supporting jobs with family supporting wages, this will help decrease the need for homes affordable at the lowest levels. If not, the shortage of affordable homes for families like those of our personal and home care aide will continue to grow. Meeting this need is a smart investment in our communities. 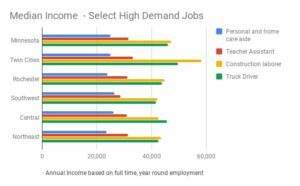 When communities have sufficient affordable places to call home, it is easier to attract and retain workers. Our seniors, our children, and our communities need the people who need affordable homes.